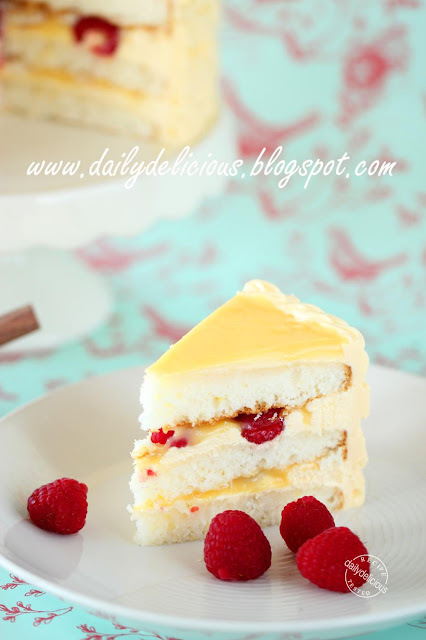 dailydelicious: Lemon-Raspberry Cake with Lemon Buttercream: Refreshing cake to brighten up your day. 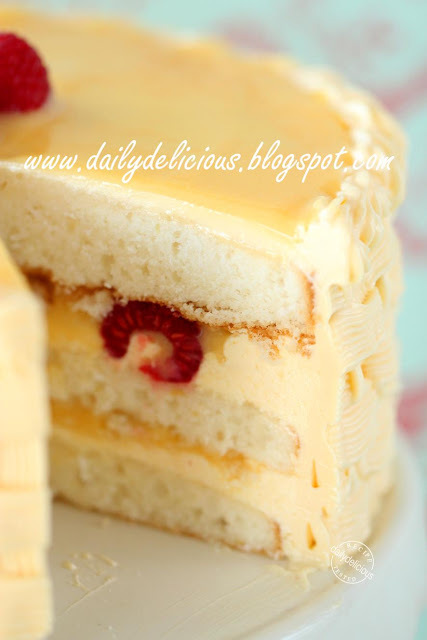 Lemon-Raspberry Cake with Lemon Buttercream: Refreshing cake to brighten up your day. I know that I have a weak point, I can't stand the request ^^, but it will depend on the situation too. If I have enough time and ingredients, I will make it as soon as possible. 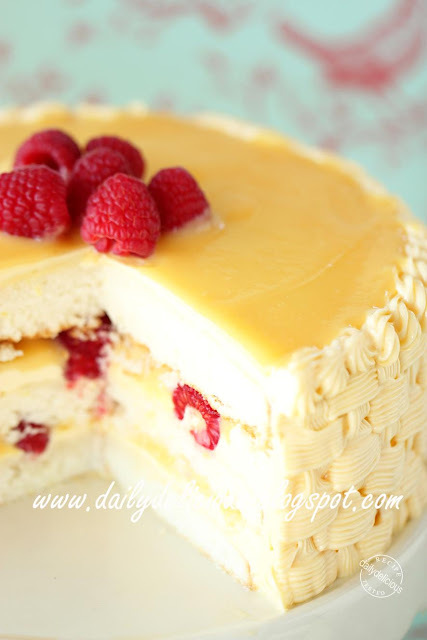 So, this time is the request again, the Lemon-Raspberry Cake with Lemon Buttercream from .................................... I got this book a long time ago, it's a gift from my dear friend ^^, many people love it and most of my friends think it's one of the best. I tried some of the recipes and they are great, but never have a chance to post it. The one who sent me the request told me that the cake dry after sitting for a long time. The cake is just a simple white butter cake, so I think sprinkle the cake with a lot of syrup will help . 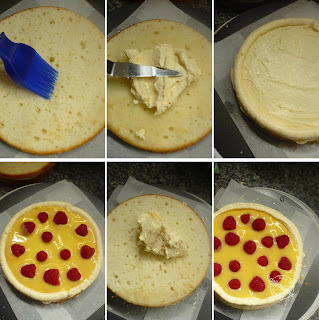 And the best way to prevent it from drying is cover the cake tightly when refrigerate and finish the cake quick, hehe. Put eggs and egg yolk in a medium saucepan with sugar, whisk to combine and light in color. 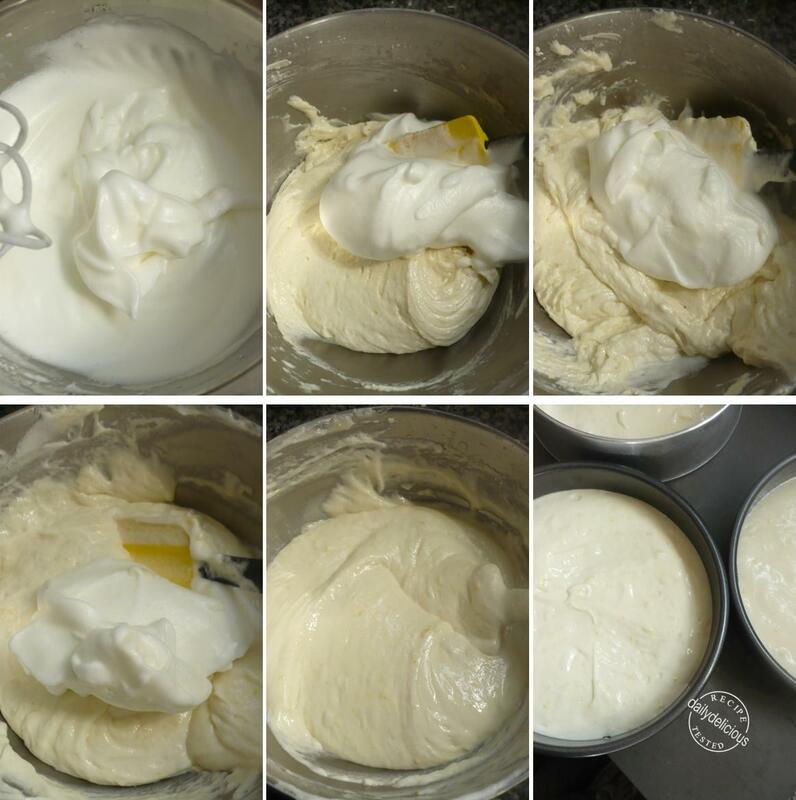 Heat the lemon juice, butter and whipping cream until almost boil, gradually whisk the hot lemon juice into the egg mixture, until all of it has been incorporated. Put the saucepan over low heat, cook stirring continuously for 5-8 minutes (dailydelicious note: I use thermometer, heat until it reach 85°C.) or until the mixture thicken and coat the back of the spoon. 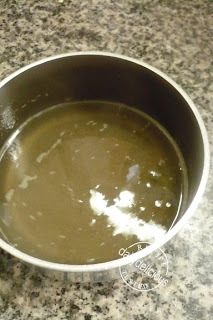 Remove from the heat and stain it through a fine-mesh sieve into a bowl whisk in the salt and vanilla extract. Cover tightly and refrigerate for 1-2 hours or until cold. Butter and flour three 7 inch round cake pans, or line with non-stick baking paper. Beat the butter, oil, salt and 100g of sugar until light and fluffy, then beat in the lemon zest and vanilla extract. On low speed add 1/3 of the flour mixture until incorporated. Add about half of the milk and continue to mix on low speed until incorporated. Stop the mixer and scrape the side and bottom of the bowl well. Add half of the rest of the flour mixture mix on low speed until incorporated. Add the rest of the milk mix on low speed until incorporated, stop the mixer and scrape the side and bottom of the bowl well. Add the rest of the flour and mix on low speed until incorporated. Whip egg white until foamy, add the rest of the sugar gradually until firm peaks formed. 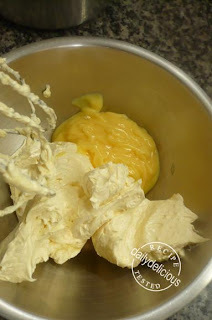 Fold the meringue into the butter and flour mixture, until fully combined. Bake for 20-25 minutes or until the top of the cake spring back when pressed lightly. (the cake will be pale in color). 1. In a sauce pan, put the sugar and water and bring to boil over medium low heat. When the syrup reaches 100°C, start whisking the eggs and yolk. 2. The syrup is ready when it reaches 117°C; pour it over the egg mixture and continue whisking until cold. Add salt and beat to combine, then add the butter 1 tablespoon at a time. 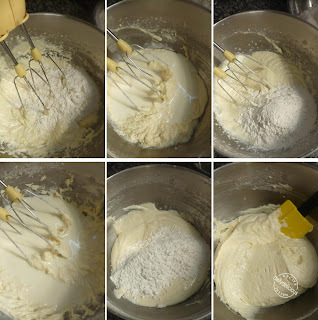 Increase the mixer speed to high for 1 to 2 minutes, or until the butter is fully incorporated. In a saucepan, combine the lemon juice, water and sugar and bring to boil over low heat. Stirring to dissolve the sugar. Remove from the heat and let it cool to the room temperature. 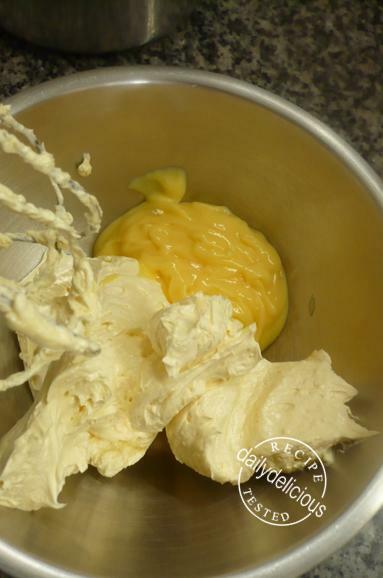 Scoop 1½ cup of buttercream into a bowl add ¼ cup of the lemon curd and whisk together until well combined. Set aside about 1/6 cup of curd for finishing off the top. Place one layer of the cake on a plate, sprinkle the cake with syrup, spread the curd-buttercream evenly to the edges. Put some of the curd-buttercream into the piping bag fitted with 1/2 inch round tip. Pipe a layer of it around the perimeter. Carefully spread about half of the nonreserved lemon curd on top of the buttercream. 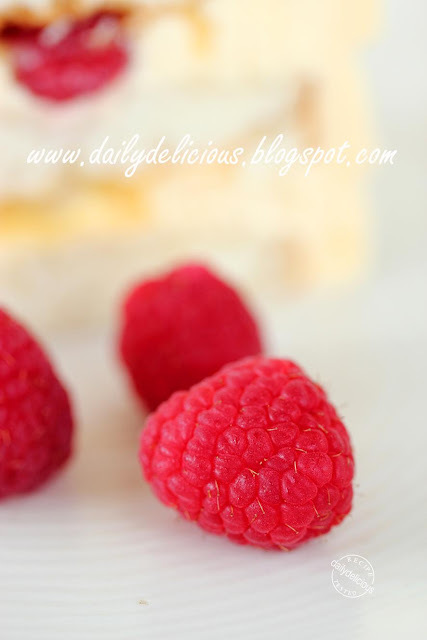 Sprinkle half of the raspberries evenly on top of the curd. Carefully place a second layer on top of the raspberries and repeat the process. 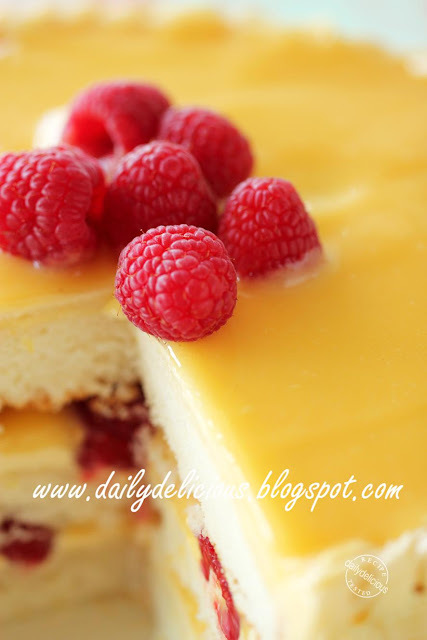 Carefully place a last layer on top of the raspberries, sprinkle the cake with syrup, cover with plastic warp and refrigerate until firm (it will be easier to frost it when it firm). Spread thin layer of plain buttercream over the top and side the firmed cake. Refrigerate the cake once again to set the crumb coat. Spread the plain buttercream over the top and side the cake, and spread thin layer of the reserved lemon curd on top of the cake. Decorate with more raspberries, and refrigerate until ready to serve. 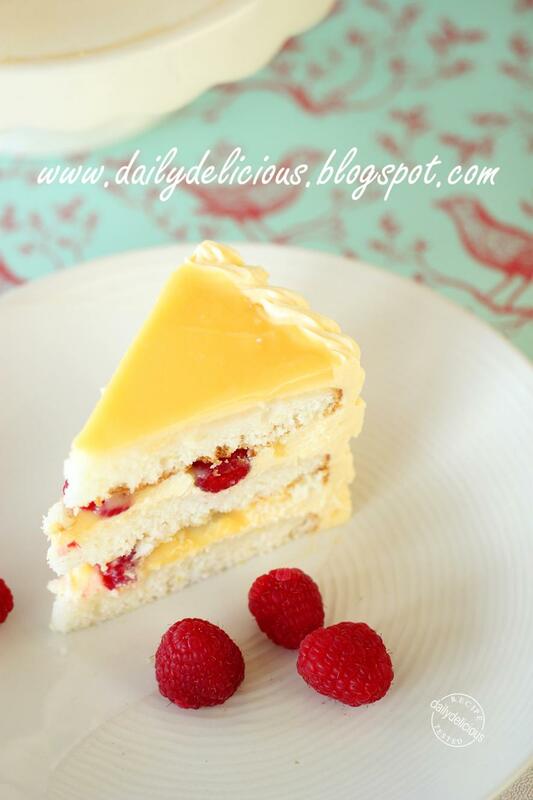 Refreshing cake to brighten up your day. Mindblowing cake..simply cant take my eyes from ur click..delicious. WOW! This is so pretty and looks so yummy. Can't wait to make this.. This cake looks so yummy!! i'll copy your receipe and let you know how it goes! Happy 2012! Montebello: Reinvent the classic "Fraisier"
Milk tart: Sweet, sweet my little tart!